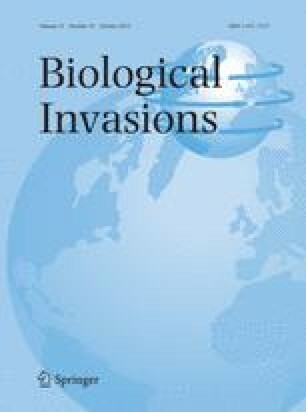 Biological invasions are considered one of the main anthropogenic factors that reduce the abundance of native species. Understanding the patterns of population structure and behavior of introduced species is important to determine invasion sources and pathways, in addition to improving the protective management of native species. Thus, we set out to advance our knowledge about the mosquitofish Gambusia spp., which is an invasive species that was introduced to southern Europe in 1921 to control mosquito populations. We assessed the genetic diversity and population structure of this species at 13 European locations, by screening variation at six microsatellite loci. We also evaluated six American samples (four of G. holbrooki and two of G. affinis) to identify the most likely source of the populations that established in Europe, and to determine whether G. affinis is also present. The results showed that, while there was evidence of recent bottleneck events in a few isolated locations, most introduced populations harbored a considerable amount of gene diversity, probably because of multiple introductions and secondary contacts. Populations displayed strong genetic differentiation that was mainly associated with geographical distance. At least two main routes of colonization of G. holbrooki seem to have occurred in Europe. The first, and more ancient colonization, was consistent with historical records, with the species invading the Iberian Peninsula. A second and more recent colonization probably occurred in Greece and, from there, France. The presence of G. affinis was not detected in any of the European samples. N. Sanz and R. M. Araguas contributed equally to this paper. The work was funded by the Spanish Ministry of Education and Science (MEC) research projects CGL2006-11652-C02-02/BOS and CGL2009-12877-C02-02. DDdM received a Ph.D. scholarship of the University of Girona. Two anonymous reviewers revised and improved this manuscript. Gail Schofield of Write Science Right revised and edited the English of this manuscript.